My mom, Bonnie Lee Schwegler Lane would have been ninety-one today. Like most moms, she had a tremendous impact on my life. But it is the little things I remember most about her. Mom, left, and her twin sister Betty about 1943. I get my love of reading from her. When I was four or five she would read stories from our beautifully illustrated book Grimms Fairy Tales. Today the stories are considered too graphic for young children but I loved them. I remember the story Snow-White and Rose-Red, two sisters living in the woods with their widowed mother. One winter night they let a bear come into their house. Night after night the bear comes and stays overnight until spring when he says he has to go away to guard his treasure against a wicked dwarf. That summer the girls encounter the dwarf who is always in trouble and each time they rescue him from his travails. And each time the dwarf is ungrateful for their help. Then one day they come upon the bear who is about to kill the dwarf. The dwarf pleads for his life to no avail. The dwarf is killed and the bear turns into a handsome prince. The dwarf had put a spell on the bear when he stole some of the princes’ jewels. Snow-White marries the prince and Rose-Red marries the brother of the prince. While the details of the story are fuzzy in my mind, I remember curling up on the bed with my mom in the middle and my brother on the other side of her. Despite the hard work she did, she had beautiful nails. I would run my little finger over her nail, back and forth, feeling the beautiful oval. Not too far into the story, my brother would squirm, being too young to appreciate the beautiful story unfolding before us. It would take several days to finish the book. She read many books to us, curled up in that bed, over the next several years. These are memories I cherish. Mom died at the age of seventy-five leaving many moments in time for me and my brothers to remember. Happy Anniversary to my Mom and Dad. Today would have been their seventy-first wedding anniversary. They didn’t make it to their fiftieth wedding anniversary either because my dad died when they had been married forty-six years. Talmadge “Tom” Hollis Lane came from the small town of Caruthersville, in the flat delta in the bootheel of Missouri. He moved to the St. Louis area in the early 1940s where he took a job cutting shoes by hand. He was to continue at this craft until he retired later in life. 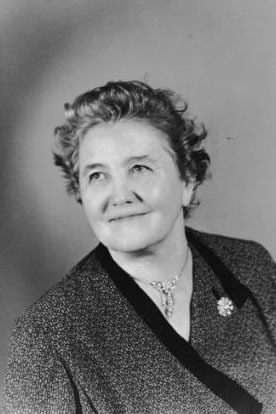 Bonnie Lee Schwegler was born in Maries County, Missouri near Vienna. Being of Swiss descent, her family lived in this area where many Swiss and Germans settled. The high, rolling hills reminded the immigrants of their homeland. By the time she was three her family had moved to St. Louis. The depression loomed and no doubt there were more opportunities to make a living in St. Louis. Mom came from a large family of thirteen children. They had plenty to eat but with so many children, necessities like clothing and shoes were in short supply. She dropped out of high school when she was in her sophomore year. Mom simply got tired of washing out clothes everyday and having shoes that were falling apart. It’s ironic that she went from having shoes that were falling apart to working for a shoe factory. She began working at Johansen Brothers Shoe factory, located in downtown St. Louis, in 1946. Dad had a very sketchy track-record when it came to women. He married Nima Tanner in 1936. This marriage produced my two half-sisters, Cleo and Kay. This marriage ended in 1945. He married again in April of 1946 only to have his wife, Mildred Foster, die a tragic death during an operation on the first of July. On the 17th of August, a month and a half later, mom and dad were married by a justice of the peace at the St. Louis County Courthouse. Why they married so quickly after Mildred died is a mystery to me. He was a handsome man and perhaps offered a way out of her situation at home. Dad died on 22 January 1993; she followed nine years later on 29 June 2002. When mom died her thin gold ring was worn down to a band the thickness of a piece of spaghetti. It reminded me of their long, rocky marriage that had worn them down during the years. But there is no doubt in my mind that they loved each other despite the trials and tribulations they put each other through. Today, and every August 17th, I remember them and honor them for giving life to me and my brothers. Through thick and thin, and good and bad, they hung on until the end. The extreme heat of this July has resurrected memories of blackberry picking of my childhood. Long before I ever picked my first berry my mother had spent many a summer in the county of her birth picking the deep purple, luscious fruit with her mother and siblings. Most likely out of need, the Schwegler family would travel to Maries County, Missouri where they would visit with family. In July, when the fruit ripened, they would don their “picking” outfits and go to their favorite thicket of bushes and spend several hours filling their buckets to the brim. Long-sleeved shirts and pants were called for or long, angry scratches were the result of reaching into the brambles for those plum morsels of blackberry goodness. After the trek, hours were spent in the kitchen brewing jars of blackberry jams and jellies that would last into the next year. 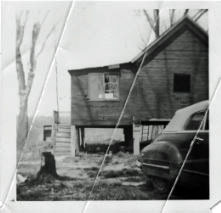 My family spent many summer weekends traveling to Osage County where my grandfather, Wright Schwegler, had a clubhouse on the Gasconade River. My mother continued the tradition of picking blackberries. And oh how I hated that tradition. I can’t think of anything worse than putting on long sleeves and pants and hiking in the heat of July. Our picking crew consisted of my mom, my brother Bill, and me. My dad would drive us to the same location every year since my mom didn’t drive. We would hike up a long hill to a massive thicket of Blackberry brambles hiding their jewels among their thorns. By the time we would get there, I would be soaked in sweat; not a comfortable feeling for a city-bred, teen-aged girl. No matter how hard I tried I still wound up with long slivers of red scratches on my arms, despite the long-sleeves, and my hands were covered with wounds from the long thorns of the bushes. I don’t ever recall my mother making jams or jellies so we must have eaten the fruit over the course of the next few days. Some of my best memories of those days at the clubhouse include warm salads made with fresh greens and tomatoes picked from my grandfather’s garden smothered in Viva Italian dressing. A short walk up the road would result in fresh ears of corn to be boiled and slathered with butter. And best of all, catfish tails from the fish caught on the trotlines from the night before were covered in corn-meal and deep-fried to golden perfection. My brother and I weren’t allowed to eat the other meat of the fish; it had to be the tails since my mother was afraid we would choke on the bones from the other parts of the fish. There were many things we weren’t able to do, which is a testament to my mother’s will to see us safely through our childhood. Unfortunately, the tradition of blackberry picking wasn’t passed on to my sons. Today, if one wants, you can have blackberries on the menu most days as they are grown all over the world and shipped to the United States for consumption. I’m not sure the blackberries we get today are as good as those picked straight from the source, but they sure are easier to come by. And despite being uncomfortable, I still have fond memories of those days so many years ago spent with my family in pursuit of blackberries ripened in July. I am descended from Joseph Schwegler of Switzerland. He was my great-great grandfather on my mother’s side of the family. Schwegler is a derivative of the Middle High German word swegele meaning pipe or flute or the nickname for someone who plays a flute. Joseph was born in Switzerland about 1829. He immigrated with his family to the United States. He came with his wife Anna and his sons Julius and Francis. Franz name was later changed to Frank. Julius was four and Fraz was one. In the last days of his life, Julius would tell family members that Anna was not his mother. Also included with the family were traveling companions, Peter Schwegler and Catherine Graninger. The family traveled steerage on the SS Hansa traveling from Wohlhausen, modern day Wulhusen, located about thirteen and a half miles west of Lucerne, the capitol of Canton, Lucerne, Switzerland. In 1863 the trip would have probably taken four to six weeks to cross the Atlantic Ocean. They arrived in the city of New York on 20 Jul 1863. I often wonder who he left behind. Did he watch their faces as he left the town? Did he shed a tear for the family and country he would never see again? No doubt he had high hopes for his new life in America. The family went immediately from New York to Centralia, Illinois. Most likely there were family or friend connections in the community that drew them to the area. The third son, Joseph, was born there in 1864. There are two hypothesis as to why the family did not stay in the area, one being Joseph was too poor to buy oxen needed to plow the sod, as that area of Illinois was part of the vast American prairie. The second being Anna passed away shortly after the birth of Joseph. From the Centralia area the family moved about one hundred and fifty miles west to Gasconade County, Missouri. Peter Schwegler stayed behind because he volunteered to be a “substitute” to fight in the Civil War for a prominent citizen of Centralia. Joseph and Peter could have been brothers. Unfortunately we don’t know what their relationship was. Joseph worked as a farm hand for a wealthy widow named Anna Fehner Kallewyne. Other records show her last name as Kalteweihr. Joseph soon married Anna on 22 Mar 1867. From this union came two more sons, Hann and Benjamin. Hann either died at birth or shortly thereafter. Benjamin was born in 1868. While the marriage record shows that Joseph and Anna were married in 1867, a land record dated 4 Oct 1866 shows that the two were married and signed a promissory note to pay Diedrich Weidemann one thousand dollars for a piece of land in township forty-three, range six west in Gasconade County. The land contained two hundred acres (more or less). The promissory note was due four years from the date signed. Anna made good on the note on 5 Oct 1871. A few months later, on 15 Oct 1867, Joseph appeared before the Clerk of the Circuit Court of Gasconade County to swear upon his oath his intention to become a citizen of the United States and denounce his allegiance to the Republic of Switzerland. Joseph’s dreams of the new life in American came to an end on 28 Feb 1870 when he died at the age of forty-one. He had only been in the country for a little more than six and a half years. He is buried in the Schwegler-Myers cemetery, a little cemetery located on the border of Gasconade and Osage Counties. Anna Schwegler would go on to become the curator for his estate and guardian for my great grandfather Julius. I am indebted to my second cousin, Bill Schwegler. While I have many of the documents supporting the events of the life of Joseph, it is the stories that were handed down from my great-grandfather Julius at the end of his life to Bill’s mother that adds the humanness to Joseph. And Bill graciously shared those stories and pictures with me. One hundred and twenty-two years ago, on November 14, 1892, Harrison Wright Schwegler was born most likely in Maries County, Missouri. He was one of six children born to Julius Schwegler and Sarah Frances Ridenhour. Our family called him Wright. On February 27, 1914, Grandpa Schwegler married Belle McKinney. He was twenty-one and she was eighteen. From this marriage came August, Oma, Harley, Willard, Roy, and Frank. The children were born about two years apart. Unfortunately, at the age of twenty-seven, Belle died on February 3, 1923 of double pneumonia. Moving quickly my grandfather married my grandmother Estella May Burt. As I mentioned in the story about my grandmother, this was most likely a marriage of convenience. My grandmother had a daughter Goldie prior to her marriage to grandpa. And grandpa had six children who needed a mother. They married on May 25, 1923 just a little more than three and a half months after the death of Belle. From this marriage was born Joseph, Bonnie (my mother), her fraternal twin Betty, Ollie, Billie, Janice and Earl. Billie died at the age of two. Their first child was premature and died shortly after birth. Grandpa was thirty-one and Granny was twenty-nine when this first child was born. Grandpa was forty-three and Granny forty-one when their last child was born. My earliest memory of Grandpa is when I turned five. We were visiting my grandparents around the time of my birthday when Grandpa took me to buy a dress for my birthday. The dress was pretty, but I remember vividly what happened after the dress was purchased. Grandpa was fond of drink to put it mildly. On our way home we stopped at the local watering hole. While he had a beer – or maybe more, I can’t remember – I ate popcorn out of a coffee filter. I had a great time. It didn’t seem like we were gone long but when we got back to the grandparents home, well … words were said and I knew my Mom was mad. Needless to say we never went dress shopping again. My grandpa was half Swiss. German was most likely spoken in his father or grandfather’s home. He had a clubhouse on the Gasconade River in Osage County, Missouri. Fishing was his passion. We spent just about every weekend with him from the time I was eight until about fourteen. And yet I don’t remember ever having a conversation with him. Oh he spoke to us but usually when he was showing us something, explaining how something worked, or when we were doing something we shouldn’t. He was a man of few words. I didn’t see my Grandpa after I turned fourteen. He and my grandmother were having problems and he had moved out of the house. I never understood why we quit going to his clubhouse until years later when I asked my mother why. Apparently he had a girl friend and my mother didn’t want me influenced by his living arrangements. From what I understand Grandpa and Granny divorced after they were married fifty years. How sad. 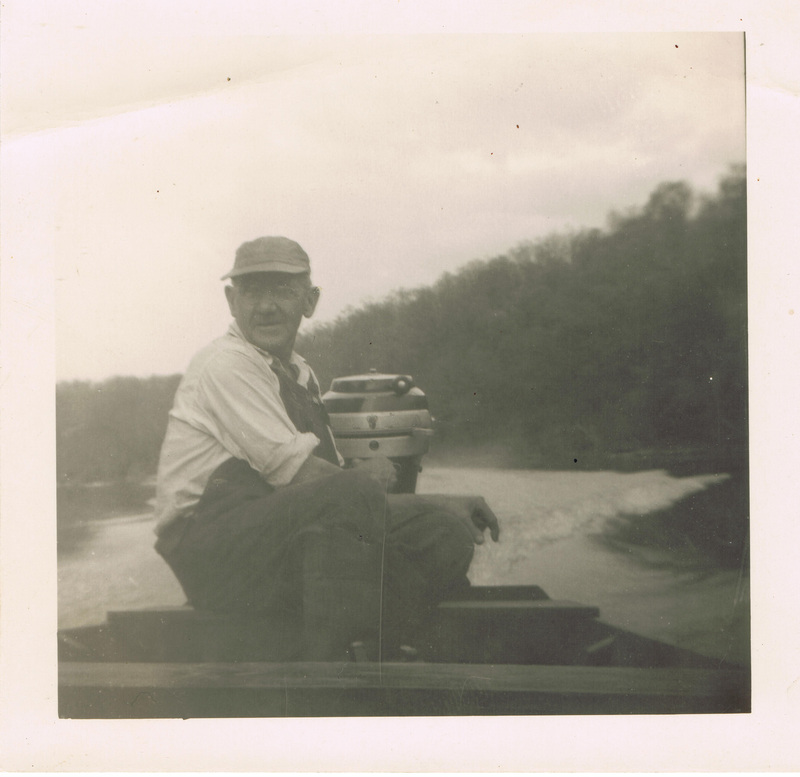 Grandpa Schwegler in his jon boat. Grandpa died January 28, 1978. Even though I really didn’t know the man, I have fond memories of the times we spent with him on the Gasconade River. There is nothing like running through corn fields, eating a salad with fresh tomatoes warmed by the sun, learning how to skin a catfish, and generally running wild in the out-of-doors. For these experiences I am eternally grateful. Estella May Burt was born November 21, 1894. Called Stella, she was born in Third Creek, Gasconade County, Missouri. She was the first girl, and third child, born to Joseph Burt and Virginia Williams Burt. She had eleven brothers and sisters. By 1910 the Burt family had moved to Crawford Township in Osage County, not far from Third Creek. Her father was a watchmaker. It’s hard to believe that he could have supported that many children by making and repairing watches. When my grandmother was twenty or twenty-one, and unmarried, a daughter Golden was born to her. The 1920 census showed Goldie as the daughter of Joseph Burt. Back then many children born out-of-wedlock were listed as children of their grandparents. On Saturday, May 5, 1923 my grandmother married Harrison Wright Schwegler in Vienna, Maries County, Missouri. Grandpa Schwegler’s first wife had died leaving him to raise six children under the age of nine. I’m sure this marriage was one of convenience since my grandfather had children who needed a mother and my grandmother needed a father for Aunt Goldie. From this union came eight children. Their first child lived only six hours before it died. One child, Billy, died when he was two years old. The remaining children were most likely born in the city of St. Louis or St. Louis County. By 1936, living on Manola Avenue in Pine Lawn, most of the older children had moved away from home. It is this house that I remember the most. It was a large house with an enclosed front porch. Three bedrooms and bathroom were on one side of the house and the living room, dining room, and kitchen were on the other side of the house. The driveway ran along the left of the house and sloped down to the back yard where a huge Osage Orange tree grew. Fascinated by Hedge Apples, the fruit of this tree, I remember my parents bringing some home in hopes they would discourage crickets and water bugs from entering our basement. I don’t think that worked. Granny came to babysit my brother and me several times when we were young. She loved to tell us ghost stories and to this day I love a good ghost story. Sometime in the nineteen-fifties she became a Jehovah’s Witness. Jehovah’s Witnesses do not celebrate any holidays. I’m not sure if it was my brother and me waking up from bad dreams or Granny telling us that there was no Santa Claus, but her babysitting days for us were over. I do believe sometime later she began celebrating holidays again because we always took her a box of Brach’s Chocolate Covered Cherries for her birthday and Christmas. I honestly don’t remember my grandfather being at the house on Manola except for a few times. He had a clubhouse on the Gasconade River, in Osage County, Missouri and spent most weekends there. Since my dad worked during the week, the weekends were the only time we visited granny. One of my favorite memories of my grandmother comes from an experience when I was twelve. Many weekends my family would go to my grandfather’s clubhouse. We would leave on Friday and come home late on Sunday. This particular weekend my grandmother went with us along with our dog and parakeet. It had rained a great deal during the week leading up to our trip. Rivers were running high and the Gasconade was no exception. The clubhouse sat next to the river surrounded by corn fields. As a precaution we parked our cars some distance away in case the river rose further blocking our exit. Saturday came and the river was high but nothing to worry about. Sunday came and the clubhouse, which was on stilts,was surrounded by water. Fortunately my grandfather had the foresight to tie two jon boats to trees close to the house. I’ll never forget the two boats riding on high water through six-foot high corn stalks loaded with my grandfather, grandmother, father, mother, brother, dog, parakeet, and luggage. It was quite an adventure. When I think of an old-fashioned grandmother, with their granny shoes and loose-fitting house dresses, I think of my grandmother. She was a tall, large woman and I loved being enclosed in her warm hug each time we left her house. Eventually her dark hair became silver white. This is my lasting picture of her. As I have aged I realize my legacy from her is my silver white hair. Estella May Burt Schwegler passed away on February 21, 1987 at the age of 92. If I’m lucky, not only will I have inherited her silver white hair but will have many more years on this earth making memories.